In an effort to aid online content creation in the Adlam script, we’ve published a transliteration add-on for Google Docs that converts Latin-script Pular texts into Adlam. Developed by Neil Patel, this add-on will help increase online content in Adlam for the 50-million people of the Pular language community. We’re delighted to announce that Microsoft is the first licensee of our Kigelia typeface family. Throughout the years, Microsoft has led the industry in adding support to non-Latin writing systems and the reach of their software tools will provide millions with access to the African scripts in Kigelia. Their efforts will also include adding input methods and OS integration to allow the language communities in Africa to have an effective tool for digital communication and content creation. We’re very excited about our typeface family going to work in Africa. 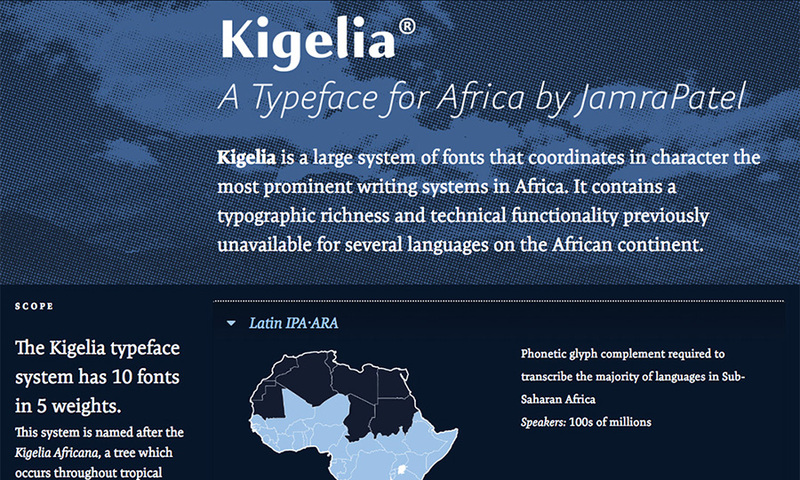 On September 15th, we told the story of developing our African type family “Kigelia” in a 30-minute presentation at the annual conference of the Association Typographique Internationale. It was exciting to speak to a large audience in a beautiful theater in the heart of Antwerp and we received excellent reviews in the hours, and days, following the talk. The video of our presentation can be viewed on our media page. The family is in testing and we’ll be announcing exciting news about it soon. Neil gave a presentation during the Face/Interface conference at Stanford University on December 2nd. His talk on “The Challenges of Integrating Newly Invented Scripts in Computing” dealt with some of the technical issues we’re facing when working with newly invented African scripts. Face/Interface was a dense and very informative conference in which a carefully selected group of speakers shared their insights into the technical aspects of type creation and implementation. 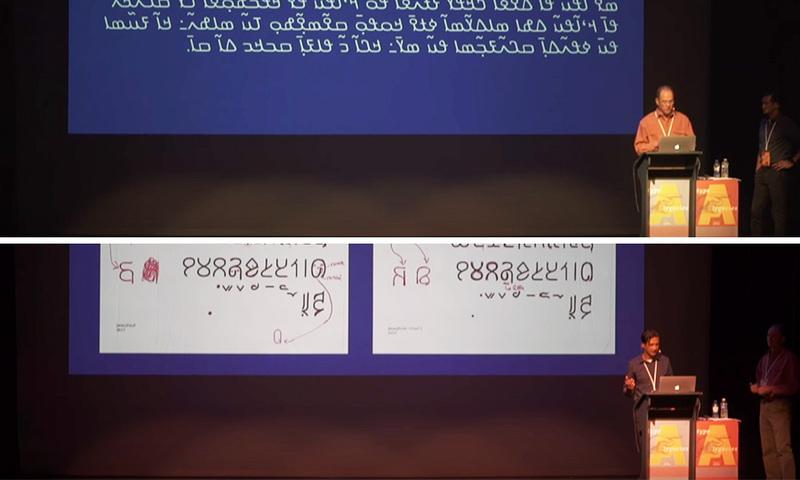 On November 7th, Mark visited the Rochester Institute of Technology in Rochester, NY and gave a presentation about JamraPatel’s work in the design of typefaces in different scripts. This was a part of RIT’s annual Design Conversations / Vignelli Legacy lecture series. The presentation showed the development of Phoreus Cherokee and also the design process for our African type system, currently in progress. On the following day, Mark spoke to ca. 60 typography students in RIT’s graphic design program about the design of typefaces. The trip also included visits to the Vignelli archives and the Cary Graphic Arts Collection. On August 26th, we presented our work on typefaces for African languages at TypeCon 2017 in Boston. The twenty-minute presentation covered our experiences in researching the scripts we’re including in a large pan-African type system, as well as connecting with experts and authorities in the language communities the typefaces will serve. TypeCon is the premier North American annual conference for type design, typography and the type industry. We’ve just launched our most ambitious app to date. CalConversion is the first multiple-script calculator/unit converter designed specifically for Africa: calculations and conversions can be made with Latin, Arabic, N’ko or Adlam numerals. This app can convert sums between all African currencies, U.S. Dollars, Canadian Dollars, Australian Dollars, Euros, Indian Rupee and Chinese Yuan. Currency rates are updated every 3 hours providing there is an active internet connection. The app also performs conversions for units of distance, area, volume and weight. The four script interfaces are easily accessed by swiping horizontally. We’ve just launched our latest app: an Adlam calculator for the Fulani people of Africa. Adlam is the newest script in our African typeface system; it was created by Abdoulaye and Ibrahima Barry of Guinea in the 1980s for the Pulaar language throughout Sub-Saharan Africa. We contacted Abdoulaye and Ibrahima, and they’re kindly advising us on apps as well as the definitive forms of the Adlam alphabet. We’ve released a new version of our N’ko keyboard for Android. The update provides users with additional characters in the International Phonetic Alphabet and African Reference Alphabet to facilitate typing Manding in the Latin script. It also includes improvements in the swipe feature to toggle between input modes. Our work on African scripts is featured in the Spring 2017 issue of How Magazine as part of an article looking at the non-Latin type design field. The article by Jason Tselentis takes a look at our design process and considerations behind developing typefaces and communication tools for the African market, as well as the efforts of other designers and higher education institutions working in the international type design field. Maine Public Radio aired a nice report on Mark’s Phoreus Cherokee last night. An audio file of the original broadcast is included in the article. The report features Roy Boney, the manager of the Cherokee Nation’s Language Program, speaking Cherokee! The reporter, Fred Bever, also mentions the African scripts we’re working on here at JamraPatel. Link to the article and audio file at Maine Public. California-based TypeEd dedicated their Typography Dojo webcast on November 16th to JamraPatel and the typefaces we’re designing for African languages. We presented an expanded version of our TypeCon 2016 presentation and then had a great time taking questions from the other people attending the one-hour webcast. We’ve launched an important new feature in our N’ko calculator app: the ability to toggle the entire app display between N’ko numerals and the Indo-Arabic numerals used with the Latin script. This new feature is intended to facilitate communication and business transactions between local business people and customers who may be unfamiliar with the N’ko script. The feature is activated with the touch of a button. The idea for this feature came from a tour of China I made in 2004, where the only channel of communication I had with shopkeepers and sales personnel was a calculator — and there was always a calculator at hand wherever things were sold. It became quickly apparent that this was the most common tool of communication between Chinese shopkeepers and customers (like me) who didn’t speak their language. It actually worked very well. So we asked ourselves: if the users of the N’ko Calculatrice wanted to quickly communicate prices to foreign customers and tourists without leaving the app, what would that look like? The answer became our latest update. Within a month of launching our Android app N’ko Calculatrice, we’ve added standard memory functions mc, m+, m- and mr to our N’ko calculator. These have been placed at the top of the keypad and appear in the N’ko script. When the memory keys are tapped, the number held in memory appears in a gray box on the right side of the results display. This is an upgrade we’re really happy about, since it provides our users with all the standard, basic features of a desktop calculator. As usual, the app is also available on the French language Google Play Store. We’ve published our second app; a calculator for Google’s Android platform. The app, called N’ko Calculatrice, uses the numerals of the N’ko-script typeface that we designed for the Manding language and dialects of West Africa. The N’ko numerals, like the letters of the script, read right-to-left. JamraPatel LLC has launched its first mobile device app: a keyboard and communication utility for the iPhone and iPad which facilitates the use of N’ko, a West African script. Portland-based type designers Mark Jamra and Neil Patel created the app after researching and designing a N’ko typeface family consisting of ten fonts in varying weights. The app consists of a keyboard, a field for composing emails, messages and tweets, and a predictive dictionary that offers word options in real time. N’ko is the writing system used for the Manding language of West Africa, a language community of around 40 million people. The dialects of the Manding language are Bambara (Mali), Mandinka (Gambia), Maninka (Guinea) and Dyula (Côte d’Ivoire and Burkina Faso). The N’ko script has some similarities to Arabic in its right-to-left reading direction and its connected letters. In case you missed it: Neil was interviewed by the Type Directors Club of New York last summer. The interview, which introduced Neil to the greater typographic community, was posted on their website and featured a look at our design of the Vai syllabary, one of the West African scripts we’re working on here at JamraPatel. The Portland Press Herald (Maine) ran a great article about Mark Jamra and his Phoreus Cherokee typeface family. Titled It’s Not Just Another Pretty Typeface (oh, those clever and witty editors), it presents the story behind the design of the first typeface family with multiple weights and cursive italics for the Cherokee language.